Mswati III was born to King Sobhuza II and one of his younger wives Ntfombi Twala as Prince Makhosetive Dlamini. 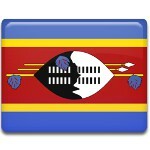 Four months later, Swaziland's independence from the United Kingdom was proclaimed. King Sobhuza died when Makhosetive was 14 years old, and the Great Council of State selected the prince to become the next king. In September 1983, he was introduced as Crown Prince. His coronation took place on April 25, 1986. Today, Mswati III is the last absolute monarch in all of Africa in the sense that he has the power to choose top government posts (including the prime minister) as well as top traditional posts. However, before making appointments he still has to consult with the queen mother, council, or prime minister (depending on the appointments to be made). Mswati III restored the Parliament, which had been dissolved by Sobhuza II. In 2004, he adopted a new constitution, allowing freedom of speech and assembly. However, it was criticized by Amnesty International. Although his reign has brought some transformation, he is generally criticized by human rights organizations.